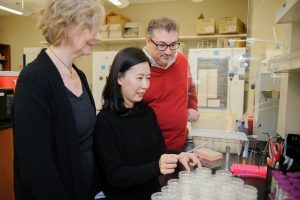 Doctoral student Hannah Him, center, works in the lab of Drs. Kim and Guy Caldwell. For the first time in the history of the Southeastern Conference, all 14-member universities have been designated as doctoral universities with the highest level of research activity by the Carnegie Commission on Higher Education, the SEC announced on Monday. This top designation, historically known as Research 1 or R1, recognizes the nation’s most elite research universities. According to Carnegie Commission data, fewer than three percent of all U.S. educational institutions are included in the classification, and the SEC is one of only four NCAA conferences with all its members in the top category. Combined, SEC universities’ research and development expenditures total nearly $5 billion and their economic impact is approximately $65 billion. Research from SEC institutions is wide‐ranging, including agricultural advances aimed at improving the human condition, medical discoveries that save lives, and technological breakthroughs that protect the nation and its infrastructures. Since 2013 the SEC has supported several research‐focused endeavors for faculty, students and administrators from its universities. Past activities include the SEC Symposium, which was designed to address a significant scholarly issue by utilizing the range of disciplinary strengths of all SEC universities; the SEC Academic Conference, which showcased SEC research in an area of scholarly interest to a range of stakeholders; and the SEC Faculty Travel Program, which enhances collaboration by establishing an opportunity for SEC faculty to exchange ideas, develop grant proposals and conduct research together. According to its website, the Carnegie Commission on Higher Education developed the Carnegie Classification in 1970 to support its program of research and policy analysis, and it is believed to be the most comprehensive review of educational institutions in the U.S. In making its annual designations, the Commission considers research funding, research staff and the number of doctoral graduates.